At a meeting last week about Tokyo 2020 we strayed away from our discussion about how they were progressing with their sustainability plans (or not as it turned out!) and touched briefly on consumer behaviour and sustainability. In particular whether companies should make it easy for consumers to buy sustainably – in effect to ‘choice edit’ and offer only the most sustainable option? Or should this be left entirely down to the consumer to decide? I am, in the main, very much in the ‘choice editing’ camp whereas my colleague was in favour of ‘consumer choice’. I am personally and professionally committed to sustainability and know first hand how difficult it is to practice what you preach in the real world. And by pure coincidence it also happened to be my 2 year wedding anniversary. I always try to make informed decisions and live a reasonably sustainable lifestyle – and organising my wedding was no different. All events, including weddings, have an impact – and we set out to make our wedding as environmentally and socially responsible as we could (given that it’s not possible to control or influence absolutely everything). Here are some of my reflections. I knew we were likely to have much more say in how the event was planned and run – and importantly who the suppliers were and what was supplied – than if we’d got married in the south of England. Unlike many other weddings we’d been to we also wanted to hold the ceremony and reception in the same place. We decided on the Loch Lomond Waterfront venue in Balmaha (around 45 minutes northwest of Glasgow) which went right down to the sandy shore of Loch Lomond. The venue also had accommodation on site and had achieved Bronze Level of the Green Tourism Business Scheme. Timber used to build the lodges was apparently sourced from Scottish well-managed forests and several had green roofs layered with alpine sedium plants (I have to confess I did not dig into their sustainable construction claims to any great extent). As standard they recycle glass, tins, paper and cardboard (which was not necessarily a given back then). Spillover accommodation was less than a 5 minute walk in Balmaha. We also very much hoped that people did not simply come for the wedding and they would stay longer – and most did. Once our 100 or so guests had arrived they had no real need to travel anywhere else. All our guests were on email so it seemed absolutely crazy to send invites out by post – so we used a fantastic service called OurWedvite.com (which no longer seems to be available which is a shame) and went completely paperless. In fact we were able to manage all communications in this way – which worked really well and we saved a fair bit of money too. My wife’s wedding dress was new – but this was not intentional. It just so happened that she spotted a dress which she loved and had been made as a sample and was going to be discarded. The bridesmaids dresses were made by my mother-in-law from scratch and continue to be worn. As with most weddings, our suits for the groom, best man, and groomsmen etc were hired. Event infrastructure, services and decorations were either hired (by far the most sustainable solution), sourced from the local area or from reused or recycled sources. Items such as the ceremonial marquee, chairs, and LED lighting were all hired. My wife made bunting out of unwanted textile fabric, our placeholders were made from cherry tree pruning’s, the cake stand was a discarded slice of oak tree, and we made our own name cards and menus from recycled paper and card. We even made our own confetti from dried flower petals from a friend who had some left over from her wedding as well as sourcing discarded petals from florists. Our rings were designed by Vivien Johnston of Fifi Bijoux – Vivien also sourced the metal and stones and arranged for the rings to be made. My wife’s engagement ring was designed especially for her and has a Koru (a spiral shape based on the shape of a new unfurling silver fern frond) at the core of its design. This symbolises new life, growth, strength and peace. The gold was ethically sourced from a mine in Chuspimayo River, County Santa Caterina in Argentina without the use of mercury or cyanide and is certified by Fundacion EcoAndina (a civil society organisation committed to the sustainable development of communities living in fragile alpine environments). The ring is set with conflict free cleaved rough diamond sourced from PRIDE Diamonds (a socially responsible diamond mining company) in Sierra Leone and ethically sourced fancy green sapphires through Fair Trade Gemstones. Our wedding rings were made from Fairtrade and Fairmined certified gold (the world’s first independent ethical certification system for gold) which was sourced from a mine in Chocó, Colombia. In the majority of instances food and beverage was sourced locally to the venue or at the very least was British. We agreed with the caterers that they would only serve locally sourced Red Tractor assured Scotch beef and RSPCA Freedom Food salmon, local and seasonal new potatoes and vegetables, tap water, organic British milk, and all tea, coffee, chocolate and sugar were Fairtrade certified too (no extra cost!). We also took the decision to source our own alcohol – even by paying corkage fees this worked out much cheaper than having it supplied by the venue. The quality of wine served at weddings can be dire! We served English white wine (Three Choirs – Willow Brook 2010), English sparkling wine (Chapel Down – English Rose), locally brewed beer and a choice of two whiskies (Auchentoshan Three Wood and Glengoyne 17 Year Old). Again another confession – the red wine was Oyster Bay Pinot Noir (from New Zealand of course) – even I would not stoop so low as to make our guests drink English red wine! Our guests actually loved the English wine and sparkling wine – although this was made clear on the menu many people did not spot this and complemented us on our choice (which was one of my personal goals). We put the whisky on the top table and people came up and grabbed what they wanted – this proved very popular and disappeared quicker than we thought it might! I knew from experience on the London 2012 Games that sourcing flowers responsibly was never going to be easy! 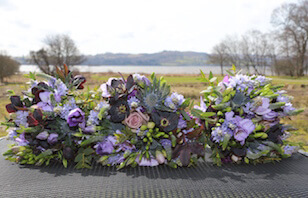 We did have one thing in our favour – my wife’s aunt and cousin, who were both very experienced florists – so all we had to do was source the flowers. But this did prove to be quite a challenge. Not just because of the time of year (April) but as consumers we had extremely limited purchasing power (i.e. we weren’t trade and we weren’t buying enough). After a lot of research my wife eventually found a flower farm located just southwest of Glasgow. However, disaster struck as the snow and ice came back with a vengeance in late March / early April 2013 and wiped out all their flowers so back to the drawing board we went. In the end we had to resort to sourcing cut flowers and plants from a variety of places – from Tregothnan (in Cornwall), assorted British cut flowers from Wiggly Wigglers, local flower markets and even Fairtrade white roses from several Coop petrol stations in the local area! My wife’s aunt and cousin did absolute wonders and turned a hotchpotch random assortment of cut flowers and plants into stunning displays. Regardless of everything else we did, the biggest impact of our wedding was almost certainly related to travel. Aside from those traveling from all over the UK we had guests from Sweden and a dozen or so relatives who flew over from Australia and New Zealand. Instead of carbon offsetting we decided to support a local charity to go some way towards compensating these impacts. We supported the Loch Lomond Rescue Boat a small local charity which is doing some amazing work in the community with very limited resources. We made a one-off donation based on our estimate of total travel impacts and encouraged our guests to do the same instead of buying us gifts. Clearly, I am a more informed consumer. Despite my professional knowledge and stacking the odds in our favour (i.e. by having the wedding in Scotland) it was no easy task to put on a more sustainable wedding. We achieved much but it was a lot of work and wouldn’t have been possible if my wife hadn’t been willing to do a lot of the legwork. Your average consumer would not have done this. I’m sure that there will be some who’d say that if we’d been really committed to sustainability we should have gone for a completely ‘no thrills’ affair. To me though that is not what sustainability is all about. Of course we need to step up our efforts in order to safeguard the future. But we need to do so in a way that is progressive and doesn’t stop people having fun. Sustainability has significant business benefits but can also be incredibly complicated to explain and deliver. Much of what sustainability is about should probably remain hidden to the consumer. The vast majority of consumers simply want things that meet their particular needs or wants. Ideally these needs or wants should be met in a way that just so happens to also help them live more sustainable lifestyles. In my view if we are to achieve a step change this cannot be left completely down to ‘consumer choice’. Meanwhile my wife continues to buy responsibly where she can – and with the arrival of our son has become very adept at sourcing quality used items via reuse and social networks at next to no cost. We have even invested in reusable nappies (but that is a whole other story! ).